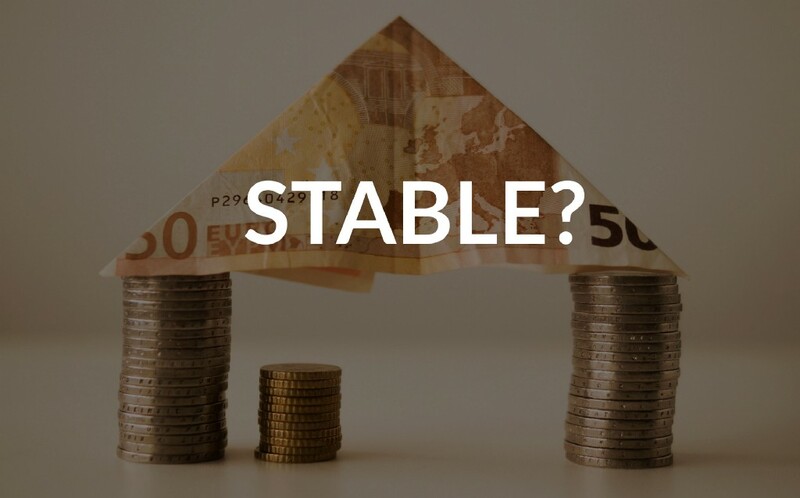 Stablecoins are cryptocurrencies which are pegged to an asset that has a stable value such as gold or fiat money (USD). For example Tether (USDT) is a stablecoin designed to be pegged to $1USD for each of its coin. How it does this depends on the stablecoin’s design. Why The Sudden Growth in Stablecoins? People realize that if they wish to use crypto as a way of transferring money or purchasing goods it is not possible if the value of the underlying crypto is so volatile. An online shop owner won’t want to receive money in crypto to then realize it has dropped 10% in a day which would hurt their profits. So a more stable form of crypto was needed. Anyone that works in finance would know that to take deposit and work with USD brings about a lot of regulations and headaches. Hence when new non-fiat based crypto exchanges popped up such as Binance, they quickly grew in popularity as account opening was much more simple. As a result investors/traders needed a stable medium to trade their cryptos and at the time there was only USDT leading to it remarkable growth. This was evidence that there was a demand for stablecoins from the community. In April 2018 the cryptocurrency startup Basis successfully raised $133M funding from top venture capitalists when they did not have a working product at the time. This definitely got people’s attention and proved that not only was there community demand but also knowledgeable investors were interested in this space as well. This is the most straightforward version, it is the concept that for every coin in produced it will be backed by the equivalent fiat currency placed in a trust. The production and liquidation of the coin is handled by the coin’s issuer. Price remains stable because if you can buy the coin for less than $1 you can go and exchange it with the issuer for $1 and vice versa. Only problem is that it relies on the issuing party being properly regulated and honoring deposits and withdrawal as they should. How The Coin Issuers Make Money: Coin issuers are definitely not doing this for free and how they make money is to take the deposits that you have given them and make financial investments. The investments should be low risk and highly liquid assets so they can give you back the money as needed. Risks: Highly reliant on the coin issuer and that if their investments are mismanaged or if the issuer’s company is mismanaged, it can take the coin down with them. As the name suggests this version uses other cryptocurrencies (e.g. ETH) as collateral for the stable coins. However because the cryptos value themselves are not stable, they need to use a set of protocols to ensure that the price of the stablecoin issued remains at $1. The protocol themselves can vary between the crypto-collateralized stablecoins but all are likely to have potential stress points/weaknesses to them. The most likely one would be if the crypto used as collateral drops in value, what happens? For this you would have to analyze the stablecoin in question. How The Coin Issuers Make Money: Again this can vary between the crypto-collateralized stablecoins but the most common business model I suspect is that they have a two-coin model: one is the stablecoin and the second is to govern the stablecoin. As a result the coin developers are likely to profit off the governance coin in some way. (I’ll cover the popular crypto-collateralized stablecoins in separate articles). Risks: Reliant on protocol design as well as the governing body (which is usually those that hold the governing coin). Also collateral is subject to a volatile asset (crypto) which is an area of concern regardless of protocol design. This is a very different design to stablecoins as it is not backed by any collateral. It operates in the way our fiat currencies work in that it is governed by a sovereign such as a country’s Central Bank. If you think about the USD, since the collapse of the Bretton Woods Agreement in 1973, the USD isn’t pegged to anything as well and is managed by the US Federal Reserve. Similarly in the stablecoin space you can achieve the same result by having “seigniorage shares”. Without getting into the details of how the seigniorage shares work (I’ll cover this in a separate article). It is essentially creating a system that will mint more coins when the demand pushes it above $1 and buy it back when it falls below $1. How The Coin Issuers Make Money: Again this varies depending on how they construct their coin. Likelihood is that they will have coin(s) in their seigniorage shares that will allow them to turn a profit and incentivizes them to maintain the system. Risks: Insufficient fund to maintain its peg aka sovereign risk. Just like real world currencies (think “Black Wednesday/Bank of England Run”) sovereigns can default and this could happen for this type of stablecoins as well. As Stablecoins continue to develop we are likely to see different iterations and implementations around it. But honestly in my opinion as long as it can do the job of maintaining a relatively stable peg of $1USD we don’t really need that many variation of it. Hence likely we are going to see weaker projects die out and some consolidation in this space. Who knows we might even see one coin to rule them all? PS. As mentioned in the article I will be doing articles that dives deeper into how some of these stablecoins operate. The post above is for informational and entertainment purposes only. Any and all information perceived through such posts, through either audio, visual, verbal or written means, should be considered the personal opinions, strategies and examples of the author and reflect his or her judgement as of the date of publication, are subject to change, and do not constitute investment or trading advice. No representation or warranty is made by the author respect to the accuracy, applicability, fitness or completeness of the contents of any information. The author of these posts shall not be held liable to any party for any direct, indirect, implied, punitive, special, incidental, or other consequential damages arising directly or indirectly from any use of the contents, which is provided as is, and without warranties of any kind whatsoever, express or implied. Any links or references to third party providers are for informational purposes only and are not warranted for content, accuracy or any other implied or explicit purpose. Investments and trading strategies are subject to market risks and potential losses and all trading strategies likewise have the potential for profit or loss. Past performance is no guarantee of future results. There can be no assurances that any trading strategy will match or outperform any particular benchmark. No content should be construed as an offer to buy or sell, or a solicitation of any offer to buy or sell any securities mentioned. In all cases, readers should never take any information perceived from this blog at face value and should always do their own due diligence on any materials to form their own opinions and best judgements. A professional advisor should be consulted for personalised investment advice before taking action of any kind. If the reader wishes to apply concepts or ideas contained in any post, such reader takes full responsibility for his or her actions. © 2018 Cham Ho. All Rights Reserved. Product names, logos, brands, and other trademarks featured or referred to herein are the property of their respective trademark holders. The Rise of Stablecoins & What Are The Different Types Out There was originally published in Hacker Noon on Medium, where people are continuing the conversation by highlighting and responding to this story.